Ornamental square tubing in a number of standard sizes and grades, including in 304/304L and 316/316L. Standard finishes include 180 Grit (#4 polish) with availability of 240 Grit, 320 Grit. 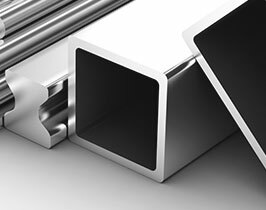 Larger square ornamental tubing can be produced to meet the requirements of larger stainless fabrications thru 12″ square with wall thicknesses in excess of ½”.